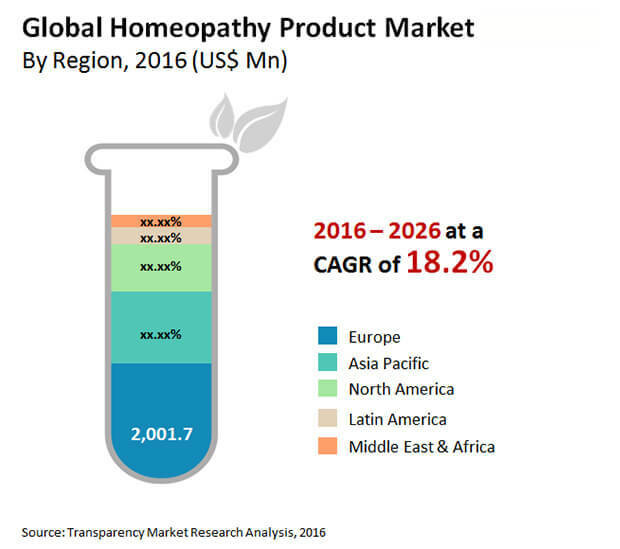 The global homeopathy product market has been expected by Transparency Market Research (TMR) to testify the presence of a significant count of small and medium-sized companies. In 2015, the global homeopathy product market was observed to have top five companies securing above 27.0% of the total share. Holding more than 17.3% share in the global homeopathy product market during the same year, Boiron Group has been anticipated to showcase a telling influence. So far, a sturdy presence in top regions such as the Middle East and Africa, Asia Pacific, North America, and Europe has been predicted to help the company account for a prominent status in the global homeopathy product market. Amid neck-and-neck competition in the global homeopathy product market, other companies such as Homeocan Inc., Washington Homeopathic Products, Inc., Standard Homeopathic Company (Hyland’s, Inc.), GMP Laboratories of America, Inc., and A. Nelson & Co. Ltd. could struggle to take hold of a strong share during the forecast period 2016–2024. However, business strategies such as expanding across lucrative regions, leveraging influential e-commerce marketplaces, and increasingly focusing on effective promotional and marketing activities could help players gain traction in the global homeopathy product market. According to a TMR report, the global homeopathy product market has been envisaged to register an 18.2% CAGR for the forecast period to expand from US$3.8 bn in 2015 to US$17.4 bn by 2024. The dilutions product type market could dominate until 2024 with a close to 35.8% share on the cards. In terms of geography, the Middle East and Africa has been foretold to be quite promising with an estimated 21.1% CAGR expected to be recorded during the course of the forecast period. The analysts have foreseen the rising aversion to allopathic medicine to bode well for the growth of the international homeopathy product market. The augmenting concern of cumulative side effects taking shape with prolonged usage of allopathic drugs could turn the attention to alternative treatments such as homeopathy. Billions of funds have been expended in the purchase of homeopathy medicines in North America. Since then, the international homeopathy product market has skyrocketed and been envisioned to be on the verge of becoming a mainstay in almost all important regions across the globe. Other factors such as a perpetual rise in the demand for convenient medicine dosages and increasing disposable income of consumers have been prognosticated to lay a solid foundation of growth in the international homeopathy product market. The world homeopathy product market has been projected to suffer a lack in demand and negative consumer experiences owing to poor quality control. The implementation of quality assurance standards through a consolidated effort could be challenging, taking into account the scattering of small and medium-sized businesses that gather a substantial chunk of revenue in the world homeopathy product market. Howbeit, vendors operating in the world homeopathy product market could make a comeback in terms of sales revenue with effective research and development activities conducted to counter the loss of quality. This has also been forecasted to improve the trust of consumers in the world homeopathy product market.